Ligaments are the connective tissue made up of collagenous fibers that attach bone to bone. Ligaments main function is to stabilize joints and help with range of motion when a tensile force is applied to the body. A ligament sprain with a partial or complete tear often occurs when there is a traumatic joint injury. 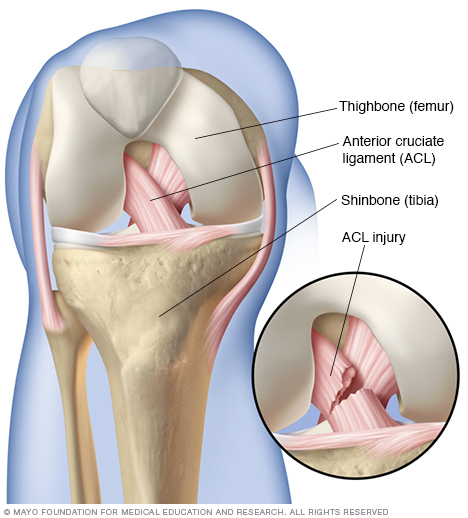 The process to heal a ligament tear can be divided into three stages. In the first stage, the ligament ends retract and a hematoma is formed. In the second stage, scar tissue is formed by fibroblastic cells over the course of a few weeks. The third stage consists of matrix remodeling in which the scar tissue is replaced by proteoglycan and collagen. Due to this remodeling, ligament injuries exhibit a slow recovery process. Ligament injuries are most common in the ankles, wrists, shoulders including AC joint separations, and knees including the anterior cruciate ligament (ACL) and the medial collateral ligament (MCL). Depending on severity, ligament injuries can be classified into three degrees. A first-degree sprain is the least severe and there is typically little tearing, pain or swelling, and joint stability is still good. It usually takes 1-2 weeks for the injury to heal. A second-degree sprain has the broadest range of damage with moderate ligament tear, moderate instability and moderate to severe pain and swelling. Recovery may take 3-6 weeks. A third-degree sprain is the most severe as the ligament is completely ruptured, the joint is unstable and there is severe pain and swelling. Other tissue can often be damaged as well. These types of sprains often need surgical repair. Recovery for this kind of sprain is much longer, requiring 8-12 months for the ligaments to fully heal. 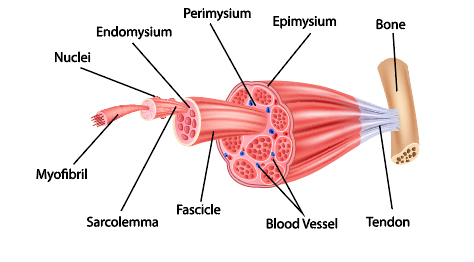 Skeletal muscles are connected to tendons that attach to the bone and consists of an arrangement of fibers. 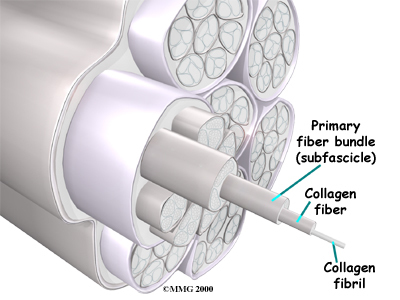 Each muscle fiber is made up of cylindrical muscle cells called a myofibril. Due to the abundant amount of blood supply and nerves in the area, muscles can perform their primary function of contraction allowing for weight bearing and skeletal movement. 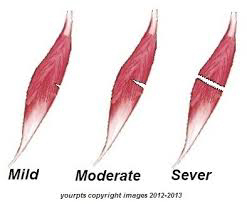 Muscle tears occur when there is damage to the muscle fibers due to overloading the muscle or fatigue from sustained postures. The normal healing process of a muscle tear also occurs in three stages. In the first stage, the ruptured myofibers contract and the gap is filled in with blood forming a hematoma. In the second stage, myogenic reserve cells and satellite cells are activated and begin repairing the damaged myofibers. Within 5 days to 1 week, the ruptured myofibers are replaced with the new regenerating myofibers. In the third stage, the regenerated myofibers mature and the remodeling phase is complete. Muscle tears are most common in the hamstrings, quadriceps, calf, and back. A first-degree strain indicates the least severe damage with little muscle tearing and mild tenderness. There is also mild pain with full range of motion. Recovery time is about 2-3 weeks. A second-degree strain occurs when the muscle has been torn and about 80% of tissue fibers have been ruptured. There is usually more pain, edema, and bruising; range of motion is also significantly reduced. There is normally swelling caused by the broken blood vessels in the area. Typically, it takes 2 to 3 weeks to have any improvement in the pain and swelling and 3-6 weeks for full recovery. It is common for athletes to resume their activity too soon afterward and easily becomes a third-degree injury. A third-degree strain indicates that the muscle tissues have been ruptured completely and the area of the body is no longer functional. There is usually visible bruising, pain, and the possibility of an avulsion fracture in which there are pieces pulled from the bone. These types of strains often need surgical repair. With a complete rupture, it takes at least three months of rehabilitation after surgery to achieve healing.